Get the most up to date announcements and information about the Wright State University Pre-Health Program. What Does a Physcian Do? What Do Medical Schools Look for in an Applicant? What Does a Physician Do? Physicians are licensed practitioners who perform medical examinations, diagnose illnesses, treat people who are suffering from disease or injury and advise patients on maintaining good health (www.bls.gov). They may be general practitioners or specialists. There are 24 specialty boards; the largest medical specialties include internal medicine, family medicine, general surgery, obstetrics/gynecology, psychiatry, pediatrics, radiology, anesthesiology, ophthalmology, pathology, and orthopedic surgery. Medicine is both an art and a science; therefore, a physician must develop the skills to interact with a patient, obtain a medical history, conduct and interpret diagnostic and laboratory studies, and develop a comprehensive diagnosis and treatment plan. Physicians work long hours, often with unpredictable schedules. A physician is committed to a lifetime of learning and helping others. The medical profession seeks a diverse mix of individuals interested in pursuing medicine as a career. The number of women applying to medical school continues to increase and in recent years, has represented approximately half of all applicants and matriculants each year. Students from racial and ethnic groups that are underrepresented are strongly encouraged to consider a career in medicine. In addition, there has been an increase in the number of older and "nontraditional" individuals pursuing medicine later in life, or as a second career. The majority of physicians work in an office setting either in solo practice or with a team of physicians. Others work in academic settings, outpatient clinics, hospitals, research, or for the military or government. Most medical students graduate after 4 years of medical school ("undergraduate medical education") and enter residency programs ("graduate medical education") that range from 3 to 8 years of additional training. Excellent Salary: average compensation for a physician is between $221,429 and $443,859 depending on area of specialization. Future Job Outlook: the Bureau of Labor Statistics (BLS) projects that employment for physicians and surgeons will grow faster than the average for all other occupations through the year 2014. Commitment to a Lifetime of Learning: medicine continues to evolve as new research is completed and new findings are incorporated into everyday medical practice. A physician must continue to learn throughout their lifetime and be intellectually curious of the changing world around them. Role Model in the Community: many people view physicians as role models and look to them for advice, guidance, and assistance. Practicing physicians speak of the privilege they feel in being permitted to care for patients and to be of service to the community. There are approximately 821,000 allopathic physicians in the United States today. In addition, there are another 59,000 fully licensed osteopathic physicians. Many of these physicians work in primary care (family medicine, internal medicine, pediatrics). Others specialize in obstetrics/gynecology, psychiatry, various medical specialties (e.g., dermatology, cardiology, gastroenterology, neurology), general surgery or various surgical subspecialties, support specialties (e.g., anesthesiology, pathology, and radiology), emergency medicine, and other clinical areas. For more information on medical school admission statistics, please visit the Association of American Medical Colleges website or the American Association of Colleges of Osteopathic Medicine website. Unbeknownst to many college students, there is no such thing as the “best” major for those bound for medical school. In fact, no medical school requires a specific major for its applicants. Even so, many students choose to major in a scientific discipline because they are fascinated by science and believe that such a major will be the foundation for a variety of career options. However, this does not enhance your chances for admissions. Admissions committees welcome students whose intellectual curiosity leads them to a wide variety of disciplines, including social sciences, liberal arts and humanities. Wright State University offers all the courses necessary to meet the requirements for admission to any medical school in the United States. In addition, all required courses are offered two to three times a year to accommodate students’ schedules. It is important to note that students who want to go to medical school will always have their best chance of getting accepted to medical schools in the state of Ohio, as long as they are Ohio residents. Ohio is fortunate to have seven medical schools, six of which grant the MD degree (allopathic medical schools) and one which grants the DO degree (osteopathic medical school). Osteopathic medical schools incorporate Osteopathic Manipulative Treatment (OMT) within their medical education and students are eligible to participate in all the same specialties offered by allopathic medical schools. Holistic Review…. what does this mean? It is defined as a flexible, individualized way of assessing an applicant’s capabilities by which balanced consideration is given to experiences, attributes and academic metrics (E-A-M) and, when considered in combination, how the individual might contribute value as a medical student and future physician. Medical schools analyze a broad range of attributes, including those related to the applicant’s skills and abilities, personal and professional characteristics, and demographic factors. AP Credits: Some students may have credit for some of the above courses through advanced placement (AP) from high school. In those cases, the medical schools usually want the students to take additional upper level classes, beyond the minimum listed above. Cultural Competency: Students are also encouraged to take electives such as women studies, African American studies, medical sociology, health communication, social inequality, and race and ethnicity to better understand how social, educational, economic, familial, and racial and gender dynamics impact the health care industry. It’s important to research individual medical programs for specific requirements. Contact the pre-health advisor for assistance. Although students can major in any area they desire, below are some common majors that students often choose. The following PDFs show sample programs of study for students to use as a guideline. Most courses are offered more than once per year allowing flexibility in your program of study design. The specific requirements can vary depending on the student and the professional school they are interested in; therefore, it is important to meet with the Pre-Health advisor to develop a schedule specific to you. You will receive five scores from your MCAT exam: one for each of the four sections and one combined score. Each of the four sections is scored from a low of 118 to a high of 132. Scores for the four sections are combined to create a total score. The total score ranges from 472 to 526. Almost all U.S. medical schools require you to submit MCAT exam scores. Many schools do not accept MCAT scores that are more than three years old. To prepare for this new exam, students are strongly recommended to complete additional courses in psychology, sociology, molecular/cell biology, genetics, and medical ethics. The Medical College Admission Test (MCAT) is a tool used by the medical schools to judge an applicant’s preparation and suitability for medical school course work and predict his or her ability to pass medical boards. The MCAT exam is an arduous 5 1/2-hour exam offered ~24 times per year and should be taken approximately a year before you plan on applying. The MCAT score is based on the number of accurate responses and there is no penalty for incorrect answers. Students receive five scores for the MCAT exam: one for each of the four sections and one combined score. Each of the four sections is scored from a low of 118 to a high of 132. The total score ranges from 472 to 526. Almost all U.S. medical schools require students to submit MCAT exam scores. Many schools do not accept MCAT scores that are more than three years old. A preview guide is available through the American Association of Medical Colleges that contains a full description of the changes and sample questions for anyone planning on taking the MCAT. The Preview Guide for MCAT 2015 can be found free online at the AAMC website or if you prefer, there is a hardcopy located in the Pre-Health office for students to browse through. Information was provided by the American Association of Medical Colleges (AAMC) which is the ultimate source of information about the MCAT and applying to medical school. For more information on the MCAT and the changes, visit www.aamc.org/mcat. What is the difference between an M.D. and a D.O.? There are two types of physicians in the United States, Doctors of Osteopathic Medicine (D.O.) and Doctors of Allopathic Medicine (M.D.). Osteopathic physicians feel they have an additional tool in treating their patients: osteopathic manipulative treatment (or OMT), which is part of a holistic approach to medicine. Follow the Pre-Med Checklist and sample undergraduate programs to prepare yourself in a timely way throughout your undergraduate years. Study the websites of interest and movies and authors to add to your knowledge of the application process and options. Ideally, the MCAT is taken in the spring your junior year, you apply to medical school in the summer between your junior and senior years, and have medical school interviews during your senior year. Contact your academic advisor and the Pre-Health advisor on a regular basis. How do I go about applying to medical school? Instead of filling out an application for each medical school you are interested in attending, you fill out only one application which goes to a central agency. These agencies, AMCAS (American Medical Colleges Application Service) and AACOMAS (Association of American Colleges of Osteopathic Medicine Application Service) process applications through the World Wide Web. When you submit your completed application to AMCAS or AACOMAS, you will designate which schools are to receive your application. Once your secondary applications have been submitted, you need to contact the Pre-Health Advisor and request that your letters of recommendation be sent. This evaluation process can take until March or April. If they decide to grant you an interview, you will generally receive a letter any time before March 1, asking for you to select a time for an interview. If you have not heard from any medical school by March 1, chances are you will not get into medical school that year. Medical schools routinely conduct interviews from September through March or April. Are there any workshops or classes I can take to help me understand the application process better? Yes. Annually, the Pre-Health Advisor offers evening workshops in the month of May. These workshops are geared towards those students who are planning on applying to medical school that summer. The workshops will provide detailed information on the application process, writing personal statements, collecting letters of recommendation, and important deadlines that must be met. Detailed information regarding these workshops are sent out through the prehealth listserv. If you are interested in participating, please contact the Pre-Health Advising office at (937) 775-4226. How can I find out what my chances are of getting into out-of-state medical schools? The Association of American Medical Schools (AAMC) publishes a book annually called Medical School Admission Requirements (MSAR). It gives facts on applications, interviews, and acceptances to every medical school in the United States and Canada. The newest version of the MSAR is available on CD-ROM. In addition, AACOM lists requirements needed for every U.S. osteopathic medical college in The Osteopathic Medical College Information Booklet (CIB). It is always best to look at the specific requirements of the school you hope to attend to make sure you have fulfilled all of their prerequisites. 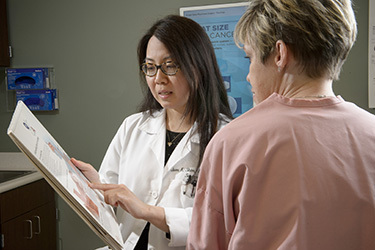 This information is available through the Pre-Health Advisor's office or in the reference section of the Fordham Health Sciences Library at Wright State. The books are also for sale in the university bookstore, or online at www.aamc.org and www.aacom.org. What is the MCAT? What is an acceptable MCAT score? Just as the ACT and the SAT are tools used by undergraduate institutions to help them decide on an applicant's suitability for undergraduate admissions, the Medical College Admissions Test (MCAT) is a tool used by the medical schools to judge an applicant's preparation and suitability for medical school coursework. It is also used to predict the applicant's ability to pass medical boards. The MCAT is delivered exclusively at computer-based testing sites and is offered approximately 24 times per year. Additional information about the MCAT can be found at www.aamc.org/students/mcat/cbt.htm. The MCAT exam is an arduous 5 ½ hour exam taken 12 to 18 months before starting medical school. Traditionally, a student takes the exam in spring/early summer of his or her junior year. The final score is reported as a composite number score (total from first three sections plus a letter for the writing section). The highest possible score is 45-T. The average score for all applicants in 2006 was 27.4; however, the average score for matriculants was 30.2. Osteopathic medical colleges don't put as much emphasis on the MCAT score as they do the entire application; therefore, average MCAT scores for matriculants to D.O. schools are often lower (usually around 25-26). A sample test is available at the AAMC website: www.aamc.org/students/mcat. A free MCAT practice test can also be found at www.e-mcat.com. Students can also purchase study materials and/or courses to help prepare for the MCAT. Please see the Pre-Health Advisor for literature regarding these materials and courses. It is important to remember that to do well on the MCAT, a considerable amount of time (several weeks to months) should be reserved for studying material on a daily basis. Is the ACT score a good predictor of how a student will perform on the MCAT? Personal qualities including outgoing personality, leadership skills, team skills, intellectual curiosity, compassion, empathy, and others. What is the Early Decision Program/Plan (EDP)? The Early Decision Program/Plan is a program at many medical schools that allows an applicant to send their materials to only one school well before the usual deadline and to receive a decision from that school promptly (by October 1st). If accepted, you agree not to apply to any other medical school; if you are denied or wait-listed, you are eligible to apply to other schools. Students should only make an EDP application to the school they would be thrilled to attend. Do I really have to take calculus and biochemistry? No. There are only a handful of medical schools that require calculus and/or biochemistry for admission, most of those schools being in the eastern or western part of the United States. If you are particularly anxious to get into one of those schools (Stanford, Johns Hopkins, etc. ), meet with the Pre-Health Advisor who can show you the individual requirements of that school to make sure you plan your undergraduate courses accordingly. While the overwhelming majority of medical schools do not require these courses, most medical schools notice if you have taken them. Performance in biochemistry is a strong predictor of success in medical school, so doing well in biochemistry helps your application. Calculus (required for both the chemistry and biomedical engineering pre-med degrees) is another course that medical schools like to see. Therefore, the best advice is: if you can take these courses and perform well in them, do so. If you do not have time to take these courses, don't worry about it. Doing poorly in biochemistry and calculus (less than a B) is worse than not taking them at all. How many letters of evaluation are required for medical school? Most medical schools required a minimum of 3 letters of evaluation or recommendation. At Wright State University, a composite letter written by the Pre-Health Advisor is attached to the individual letters of evaluation and sent electronically as a single file through Virtual Evaluations. A composite letter consists of individual letters of evaluation (maximum of 5 total) that are collected by the health professions advising office and supplied to the application service under a cover letter from the Pre-Health Advisor. Medical schools require at least 2 science faculty evaluation letters. Other letters can be from other faculty members, research investigators, practicing physicians or health care professionals, or employers. What is the medical school interview like? Only applicants that are seriously being considered for matriculation are generally invited for an interview. Applicants will be expected to discuss their motivation for medicine, their personal and professional goals, and their assessment of current health issues. Interviewing formats vary and can either be one-on-one or in a small group. Applicants are usually provided with information about the school's interviewing process before the interview. Most students will be taken on school tours, meet with current students, and discuss financial costs with an advisor. For assistance in preparing for the interviewing process, please contact the Pre-Health Advisor or the Career Services office to schedule a mock interview. What types of extracurricular activities and work experience should I have in order to be a competitive applicant? Leadership positions, such as in student organizations, charity organizations, fundraiser activities, etc. "Quality and persistence are far more important than quantity"
When will I find out if I am accepted into medical school? Medical schools agree not to inform candidates of acceptance prior to October 15, except for EDP applicants who will be informed by October 1. By March 30, each school is expected to have issued a number of acceptances equal to the number of places in the first year class. Prior to May 15, accepted applicants have at least two weeks to respond to an offer of acceptance and can hold acceptance offers from any other schools without penalty. After May 15, medicals schools may implement school-specific procedures for accepted applicants, which might include a shorter response time (less than 2 weeks), a statement of intent, and/or a deposit. For a complete set of guidelines, a student can view the "AAMC Recommendations for Medical School Admission Officers" at www.aamc.org. Medical schools will send a letter of acceptance to an applicant notifying them of the amount of time they have to respond to their offer. They expect the response to be made in writing, whether accepting or declining, within the time period they designate. Many applicants will receive multiple offers. The suggested procedure is as follows: (1) rank the schools you have applied to in order of preference, (2) once an offer has been received, send a letter of withdrawal to all schools on your list that fall below the school to which you have been accepted, (3) as you receive each new acceptance, either accept it or reject it on the basis of how the school ranks on your list. Applicants are eligible to accept multiple offers; however, when an applicant receives an acceptance from their first-choice school, they should withdraw from all other schools so that they hold no more than one medical school place at one time. 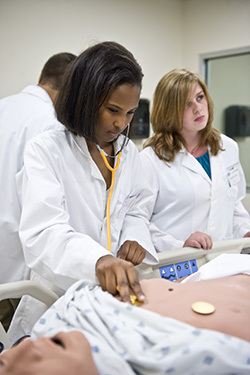 What percentage of Wright State students are accepted to medical school? One hundred percent of our applicants might be accepted if they.. When applicants do not meet all these standards then the percentage of acceptance falls. For this reason, some undergraduate institutions do not calculate percentages at all. Others use formulas that exclude certain applicants, such as those who do not score the national average on the MCAT or have grades below the national average GPA. Selective undergraduate general enrollment policies, such as at private institutions, may also raise their percentage of applicants who actually matriculate into medical school. At Wright State we don't inflate the med school acceptance percentage. We don't exclude anyone who has not met the standards above. We look at all the applicants in a give year - whether they are our traditional undergraduates, people changing careers who are enrolled in Wright State premed courses, graduate students, or students who returned to Wright State after many years away from school. Altogether, roughly half of the applicants from Wright State get into medical school. Between 10 to 15 percent of the Wright State University School of Medicine is made up of Wright State undergraduates each year. Are there any joint degree programs provided with medicine? Yes, some programs will offer a joint Master's (e.g., Public Health, Business Administration) or Doctoral (Ph.D., J.D.). For more information on these degree programs, you can review the MSAR publication or see the Pre-Health Advisor. Does Wright State have a pre-med student organization? Yes, the University has a well-developed premedical society that includes undergraduates interested in a variety of health professions. This organization provides mentoring, educational speakers, volunteer and community service, and social activities. If you are interested in joining, please contact the Pre-Health Advisor. Medical School Admissions Requirements (MSAR): published annually by AAMC. This publication provides latest available information on selection criteria for each medical school. The book is available for purchase through the AAMC website, or can be found in the school library or the Pre-Health Advisor's office. MCAT Essentials: available as a PDF document from the AAMC website. www.tomorrowsdoctors.org: a comprehensive website for those considering a career in medicine. American Medical Association: Provides information about becoming a physician, how to prepare for and apply to medical school, and choosing a specialty. www.ExploreHealthCareers.org Sponsored by the American Dental Education Association, it provides about all health-related occupations.